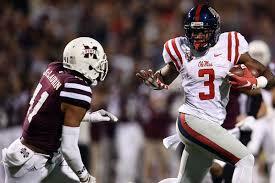 WR-Damore’ea Stringfellow, Ole Miss 6’ 2” 219 lbs. Cons: The most glaring blemish on his résumé is the reason he left Washington: he was charged with two counts of assault and one of criminal mischief. According to reports, he got into a fight during a Super Bowl celebration. Stringfellow learned a young woman had taken photos of his fight, and he fought to gain control of the camera and it ended up in a fire. Within an hour of the first incident, the young man repeatedly punched another fan and left the scene. This caused him to transfer to Ole Miss and no other reports of wrongdoing were found at the time of this writing. Gamewise, Stringfellow is more of a long strider than a sprinter, so it takes him time to build up speed, more so than many wide outs. He will probably not time better than a mid 4.5 40 yard dash. He doesn’t run clean, crisp routes as he tends to round a lot of them off. The former Rebel is not an accomplished blocker; he seems to get in the defender’s way for a few seconds instead of really engaging. It might be more of a mindset as the receiver appears lazy when the ball is not going his way. There are too many concentration issues that lead to missed opportunities for this young man as well for example: he makes a spectacular catch on one play and on the next he drops an easy target. Pros: The receiver usually lines up out wide, but lines up everywhere and constantly flips sides of the field. He has a physical side that he uses to box out defenders, knocks around aggressive coverage and can make the difficult catch with someone draped all over him. The former Rebel adjusts well to the ball in the air, grabs the ball at its highest point and usually in stride and is willing to sky-high or go low for the worm burners. Stringfellow is a good leaper, but sometimes jumps for the pigskin unnecessarily. The wideout is a terrific red zone threat who combines double moves, stutter steps, and stiff-arms to create separation. Bubble screens are very effective with his good balance, vision, and short area burst. Overall impressions: There is some rawness to his game and his junior year stats of 46 receptions for 716 yards and six touchdowns doesn’t overly impress. However, I see him quite similarly to suspended Steeler Martavis Bryant, who also is a downfield threat with a bit of unorthodox style of wide receiver play. Without knowing where he will end up in the next level, I would draft him in the second to last round of your rookie draft.